It just takes putting in a bit more effort continuously over time to become great – start with these 4 easy tips. Customer service is a significant part of any business today. When your phone rings, the person on the other end is likely suffering from a problem. This problem disrupts his/her life; it is terribly inconvenient and potentially expensive. As consumers, we all know how impactful a positive call experience is when looking for service. Our conversations influence our buying decisions and have both immediate and long-term consequences. 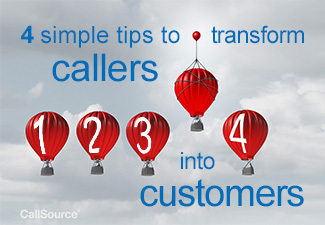 Here are four ways to help your call handlers have the conversations that transform callers into customers. It is imperative that call handlers see themselves as sales people. Call handling is not simply a reactionary role, and the goal isn’t just to answer questions. A call handler’s goal is to sell the appointment and get it booked. Even though a caller may get off the phone feeling satisfied that all of their questions were answered, the call handling process would not be complete without a concerted effort made to book an appointment. If you had just ten words to explain why people should buy from you instead of the competition, what would you say? If you had just ten words to explain why people should buy from you instead of the competition, what would you say? Crafting a value proposition requires reflection on what is unique about your company and your products and services. Having a powerful value proposition is not enough; it must be communicated effectively to achieve optimal results—book the appointment. The goal isn’t to provide a laundry list of the business’ value, but to create a strategy for presenting value on calls. If you just read the caller a list about the value of your company, they may or may not see it as relevant, of interest or value. You need to refine your value proposition until you can articulate it in a single, instantly credible sentence. When it comes to overcoming objections, remember to stay focused on how to help the caller rather than how to make the sale. If the caller gives you an objection, reflect back on the caller’s needs and concerns, so they remember why they called, to begin with. Uncover those hesitations by asking questions. It is up to the call handler to find out what it is that the caller values and, in turn, to explain how your business’ services align. In doing so, your company is filling a need. Your business now becomes the solution, not an expense. Customers will likely be educated about your offerings before even picking up the phone. Expect conversations with customers that have already researched your products, interacted with your content, and more. It’s safe to assume they already know something about your company and they want to find out if you are the right fit for them. Use customer testimonials during your conversations to provide additional authentication. People who used your products verify your value. Social proof is a powerful tool for the quick decisions needed in today’s business world. Have any other tips that you use internally to improve your phone conversations with potential customers? Drop us a comment below! And don’t forget to subscribe for more insight like this to improve your business.